AARGH! I am so mad; I took pictures of myself in a few different mirrors this past week at the beginning and end of two rolls of film and guess what--they aren't there. Maybe I'm a ghost. Certainnly looks that way from attached photo! And the crazy thing is I rushed to finish to rolls by taking pictures of the dying flowers in my backyard thinking, "Ah, this would be an interesting art project. Call it Back To School. Frame a series of ive or six photos of dying plants/flowers." But I'm probably the only one wou would get the joke. And the photos? Not as spectacular printed as when looking through the lens. Is there a lesson in this? Anyway, I was in NYC the past 3 days and while at my dad's I searched through five boxes of old photos looking for, what else, photos of ME from when I was a little kid--and photos of my old friends. While looking, I found this. And it will be the first of three. We'll call it decades. The 2nd will be from 10 years ago. The third of today. 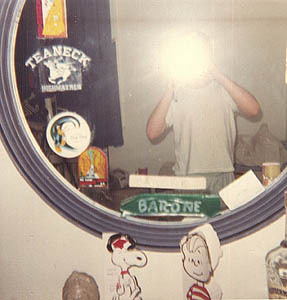 Not a great picture, but I am a ghost and the photo is about 25 years old; so do I get some kind of award for taking pictures for Jezebl's Mirror before Jezebel's Mirror was installed?